In the framework of the 14th Athens Digital Arts Festival, Multitrab Productions organizes the special screening event: The 8th Day | Human Created Machine. In our times, as the relation between technology, science and art is constantly strengthened, these three sectors shape the manifestations of human behavior and expression. Through the above mentioned triptych, art-technology-science, man manages not only to explain the physical world but also to redefine his potentials and create new, digital realities. With the help of technology, art and artistic creation are used as the intermediaries of communication between inconceivable, complex scientific knowledge and humans. They promote research and innovation, especially to the young generation enhancing their interest in the exploration of new developments. Thus, the wider public comes in contact with science and technology, integrates them experientially and becomes more educated. On the other hand, as the development of science and technology drastically changes all fields of life, making man a “powerful creator”, art and philosophy come to question and criticize the way this power is controlled and handled. The technologically advanced world is not a terrestrial paradise; on the contrary, it can pose several risks even for its own creator, man. As a result, with the aim to explore both utopian and dystopian views on the future of art, technology and science, Multitrab Productions and the 14th Athens Digital Arts Festival invite you to a two-day event with screenings with free entrance. The program of the film tribute includes premieres of renown films, documentaries and video art. On the 8th day man created machine. But he did not rest. 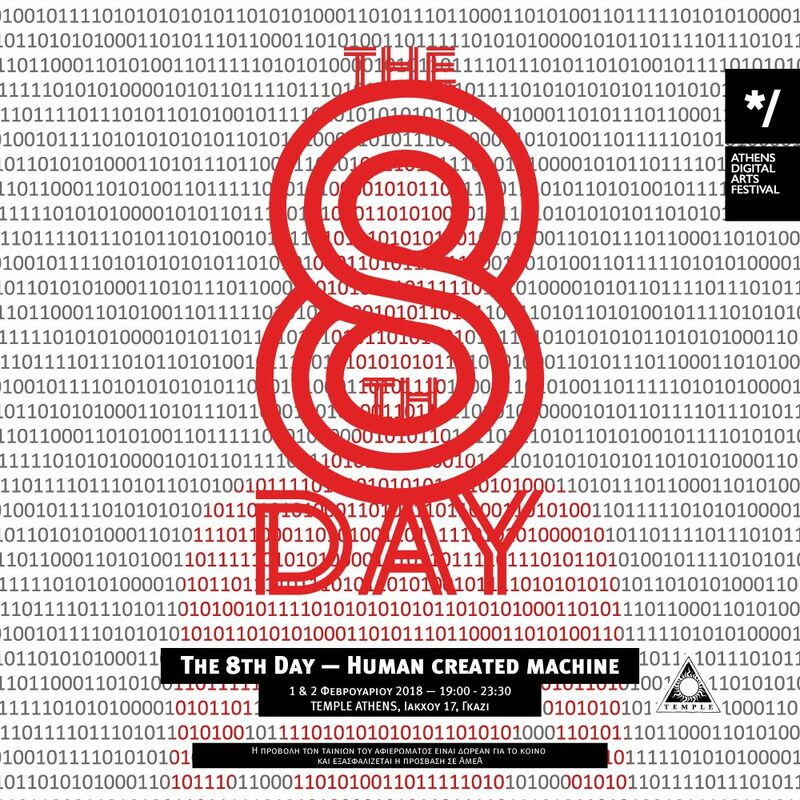 The tribute “Τhe 8th Day | Human created Machine” is implemented through the Operational Program “Human Resources Development, Education and Lifelong Learning” and is co-financed by the European Union (European Social Fund) and Greek state. Its co-funded projects deal mostly with the improvement of education and employment in Greece. Its main targets relate to the development and promotion of human resources skills, actviies against unemployment, strengthen social cohesion and social inclusion of vulnerable social groups, improvement of the quality of education & lifelong learning, awareness on environmental education, linking education with the labor market. The film tribute has free admission and it’s accessible to disabled people.